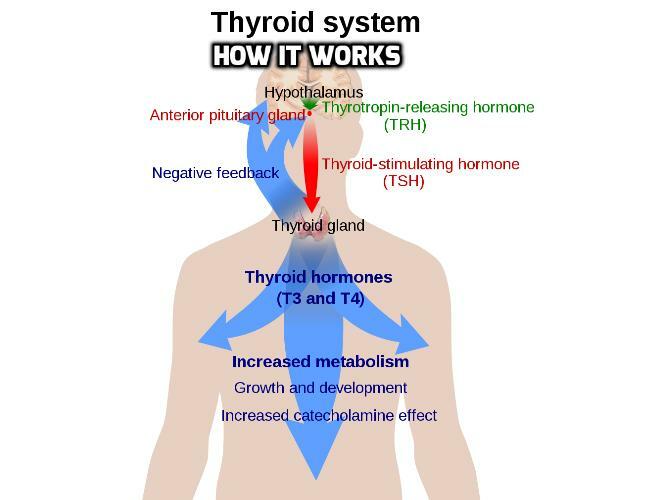 The thyroid produces two main thyroid hormones, thyroxine (T4) and triiodothyronine (T3). Production of your thyroid hormones is governed by another thyroid hormone produced in the pituitary gland located deep within the brain. This thyroid hormone is called thyroid stimulating hormone (TSH). While TSH is considered a thyroid hormone it is not actually produced in the thyroid. Once released by the pituitary TSH travels to the thyroid via the bloodstream to stimulate production of the thyroid hormones. When levels of T4 and T3 fall, the pituitary secretes more TSH. Conversely, as T4 and T3 levels rise the pituitary secretes less TSH. Normally this feedback system ensures your body has adequate amounts of both T4 and T3. When TSH is high it is a clear indication your body is suffering from inadequate thyroid activity. A healthy thyroid gland manufactures far greater quantities of T4 than T3. While T4 does have some effects, it is considered the ‘storage’ form. T4 is converted to T3 by the body when a greater thyroid response is needed. This means T4 is on standby, ready to be quickly converted into the active T3 when it is required to boost the metabolic rate. Thyroid disease results from an underactive or overactive thyroid that produces too little or too much of the thyroid hormones. Knowing how your thyroid works helps you understand your thyroid problem. It also helps you understand why it’s vital to get more than TSH tested. The widely held belief that TSH is an accurate marker of thyroid health is misleading. Below Here are 2 videos for you to understand more about thyroid hormones. Read more about the 5 tests you should discuss with your doctor to get a real diagnosis. You may already know your thyroid is one of the most important glands to regulate your metabolism. The thyroid produces crucial hormones that are released into circulation to generate activity in every organ and body system. These vital thyroid hormones help your body use energy, stay well, keep warm, and ensure your digestion, brain, heart, muscles, and other organs keep working properly. As these hormones spark energy production they influence your metabolism. In effect, they run how efficiently your body burns calories for energy. Your thyroid is your metabolic control center. 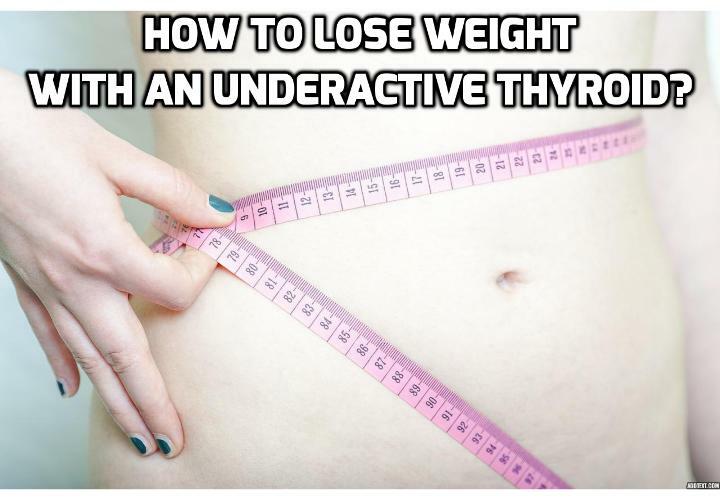 When your thyroid is working below par your metabolism slows down. It then becomes extremely difficult to lose weight. You may even feel too tired to even try. And as your energy dips you could also start to crave sugary foods for energy. A sluggish thyroid may also lead to a long list of symptoms such as fluid retention, mood swings and an overwhelming feeling of being exceptionally run down. When it comes to weight gain T3 deserves a special mention. T3 is your most potent thyroid hormone. T3 is the thyroid hormone that really revs up your metabolism. In fact, far greater amounts of T3 are converted from thyroxine (T4) when your body wants to step up metabolism. For many people with a low thyroid the body is not properly converting T4 to T3. Only a check of both free T4 and free T3 will reveal if this is occurring. The standard reference range for free T3 is 4.0-8.0 pmol/L. This provides a very good clue that you ideally want to see your free T3 test result above 4.0 pmol/L. If your free T3 is below 4.0 pmol/L you are more likely to find it hard to lose weight. I recommend getting the top 5 thyroid blood tests done. Here is a quick checklist of the most important thyroid tests; thyroid stimulating hormone (TSH), free T4, free T3, reverse T3, and your thyroid antibodies. If your doctor won’t do comprehensive testing, consider finding one who will. Secondly, once you have these results it’s very important to investigate WHY your thyroid is not functioning properly. Once you discover why you have a thyroid problem you can start to solve it. This could save you years of suffering and heartache. A holistic perspective seeks to find the underlying root causes and then treats all aspects of your health. Rather than simply treating your thyroid symptoms, an individualized treatment plan will help you get your health back on track. Did you know your thyroid hormones regulate your body temperature? When your core body temperature is consistently low it’s a strong signal your thyroid is working below par. What is an ideal body temperature? Your body works best within a very narrow temperature range. Enzymes, hormones, vitamins and minerals work best between 36.5 – 37.5 degrees Celsius (97.8 – 99.8 degrees Fahrenheit). A colder body temperature can indicate you are experiencing reduced metabolic activity due to low thyroid hormone activity. 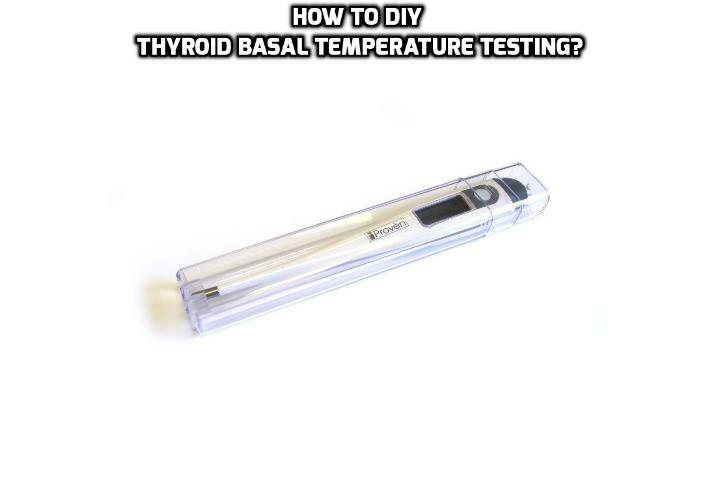 Testing your basal body temperature is therefore a simple way to assess your current thyroid health. Place a digital thermometer by your bed before going to sleep at night. This will make it easy to grab in the morning. As soon as you wake up and before you get out of bed place the thermometer in your mouth. It is important to make as little movement as possible. Lying and resting with your eyes closed works well. Read and record the temperature and date. Do not get up until you have this temperature result. When you get up and move around your temperature naturally rises. Perform this test on at least five mornings. If possible do this test around the same time each day. Note: Menstruating women should avoid doing this test around the middle of their cycle as body temperature naturally rises at ovulation. Men and non-menstruating women can perform the test at any time. There is a strong correlation between your waking, or ‘basal temperature’ and how well your thyroid is functioning. Under normal conditions the body is able to maintain a fairly steady core body temperature of 37 degrees Celsius (98.6 degrees Fahrenheit). If your temperature appears to be consistently below 37 degrees Celsius (or 98.6 Fahrenheit) you should discuss your findings with your healthcare practitioner. Basal temperature testing is not usually used as a stand-alone diagnostic tool. Your basal temperature is considered along with other signs and symptoms of an underactive thyroid. To provide some perspective on how significant even small changes in body temperature can be let’s take a look at two potentially dangerous situations. Conversely, mild hypothermia occurs when the core temperature drops below 35 degrees Celsius (95 degrees Fahrenheit). In severe hypothermia, the core body temperature drops to 32 degrees Celsius (89.6 degrees Fahrenheit) or lower. As the core body temperature cools the vital organs produce less heat which in essence causes a protective ‘shut down’ of the body to preserve heat and protect the brain. Low body temperature slows brain activity, breathing, and heart rate. Many hypothyroid sufferers would be familiar with these symptoms!